Today's media empires were built through constant reinvention, reinvestment and risk taking. If Big Media wants to thrive in the digital era, it needs to remember its past and move beyond its present. This means reframing priorities, actively pushing audiences online and fully embracing category experimentation. It's not too late, but time is running out. If you could go back, how much would you be willing to pay for a cable system in 1980? Or a telephone exchange in 1970? What if it weren’t a single system, but Comcast’s present-day footprint? Even in 2016 dollars, there’s essentially no price that wouldn’t have been worthwhile. And it shows. Nearly anyone who rolled up franchises, exchanges, systems or broadcast spectrum at scale became a billionaire. Domestically and abroad. A lot of this value was unexpected. Telephony footprints, for example, led to cable footprints, which in turn begat broadband. You didn’t even need to know where this infrastructure was going or how it would be used or monetized in order to benefit – just as you didn’t need to own the services and content on top of that infrastructure. Every few decades, the media industry experiences a generational shift in infrastructure. We’re in the midst of one right now – only there’s a key difference: this shift isn’t about physical transmission assets or distribution bandwidth, it’s about attention. But just like print, radio, broadcast and cable before it, the “attention infrastructure” race will eventually settle and leave us with clear winners, losers and also-rans. How to monetize this investment, to what extent and through which mechanism – these are all second order questions. Despite the enormity of the attention opportunity, almost every traditional video company is focused not on attention dominance, but on executing a seamless economic transition to digital. Their priorities, products and investments won’t be “digital-first” until the moment when the decline of Pay TV intersects with the rising OTT opportunity. Though well-intentioned, this strategy is deeply flawed – and principal among these flaws is the lagging nature of Pay TV profitability. Almost every cable network has distribution deals that take them through the end of the decade (if not past it). Although cord cutting will reduce total affiliate revenues, declining audience engagement will long precede (and exceed) these topline losses. Advertising revenues, too, provide a false sense of security. Over the past decade, television’s share of total ad revenues has been largely flat even as digital devoured more than a third. CBS chief Les Moonves uses this fact as proof of Pay TV’s resiliency, but this trend cannot persist ad infinitum. As digital grows its share of total media time (already at 47%), measurement improves and marketers become more comfortable with online advertising, TV will inevitably cede share. It’s also important to put this supposed resilience in context. The television ad market remains robust in part because viewership is in decline. As audiences disengage with the medium, ad impressions become more scarce – creating a shortage that, to date, has bid up CPMs for the inventory that remains. 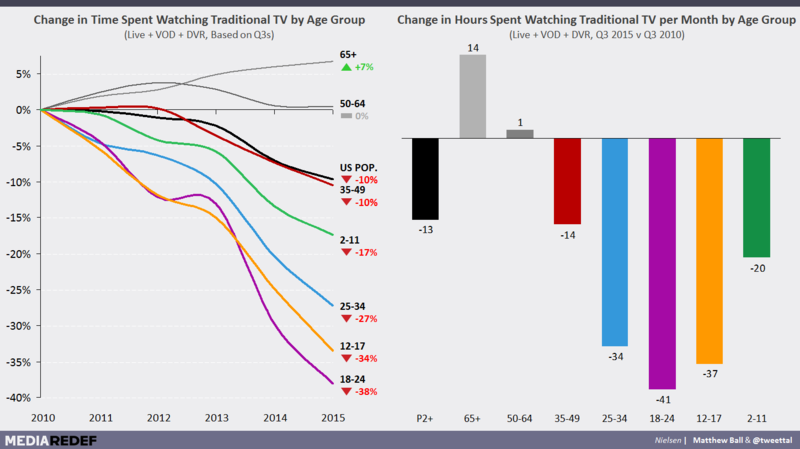 This is especially true for networks that cater to younger demographics, as these viewers are most valuable to marketers and show the greatest percentage drop in TV consumption. This is not a healthy trend, regardless of the short term effects. Most importantly, however, the “seamless” transition strategy assumes that the competitive dynamics of OTT video will be the same as they were in the traditional Pay TV business. They won’t. Even if each of the major media companies moves online in lock-step and at the “perfect time”, almost all value will accrue to just one or two players. And that’s assuming Netflix, Amazon and YouTube haven’t already locked down leadership positions by then. As a result, early mover advantages will be far more valuable than ensuring financial consistency. The media business is about selling minutes – minutes to consumers, minutes to advertisers, and minutes to distributors. On that basis, we’ve seen “sales volumes” fall by amounts that would cripple business in most other industries. On the less drastic side, NBCUniversal is down 11% (23% if you focus on its two dozen cable networks) and Disney 14% (23% ex-ABC). Time Warner, meanwhile, has lost 21% of the minutes it delivered during the 2010 – 2011 season, A+E 30% and Viacom an astounding 35%. Notably, neither Fox nor CBS have seen meaningful losses – and Discovery is even up a third. But more importantly, Netflix has grown more than 650% over this same period, making it the fifth largest video provider in the United States today. And with three years of 40% annual growth under its belt, the service is on track to take the #2 spot by this time next year. Although the major networks argue that Netflix consumption proves their content is as popular as ever, claiming these minutes overstates audience awareness and misunderstands digital-era competitive dynamics. Furthermore, this provides these content suppliers with none of the strategic benefits or adjacent revenue opportunities that have traditionally come from infrastructure ownership. Making matters worse, these networks are overwhelmingly focused on preserving their linear minutes and avoiding anything that might undermine their monetization. Efforts to support online consumption bear this out. Only 17% of America’s 100M Pay TV homes used TV Everywhere in the fourth quarter – not 17% of America’s 285M TV viewers, 17% of its 100M TV households. Compare that to Netflix’s 45M accounts, many of which boast multiple users per subscription and tally more than two hours of watch time per day. And when a Pay TV subscriber does use TV Everywhere, they’re almost always inundated with linear ad loads that repeat the same ads two to three times in a row (and at every break). This is in part a commercial problem – digital ad targeting should enable CPM lift that can offset a reduction in ad loads – but the pain is mostly felt by consumers. And they’ve responded accordingly. Even if every TV Everywhere stream started in December was completed and an hour long, this consumption would have increased national TV time by only 1.9%. Of particular absurdity is the fact that a number of network groups continue to hold TV Everywhere hostage in the hopes of extracting higher fees from MVPDs. Time Warner Cable customers (which represent 10% of national Pay TV subscribers) still can’t watch any of Disney non-ESPN channels or Time Warner’s non-HBO cable networks over-the-top. Hulu, meanwhile, remains Big Media’s most promising digital initiative – but also one of its of most hampered. Contrary to popular belief, owners Disney, NBCUniversal and 20th Century Fox are only obligated to provide the current seasons of shows that are produced by their own production company and aired on their own broadcast network (and with exceptions, at that). As a result, Hulu provides an incomplete (and inconsistently windowed) catalogue of content and routinely loses out on titles owned by its own shareholders but nevertheless licensed to its competitors. And in most cases, the only way to secure these rights is to outbid Netflix and Amazon by spending the capital provided by these same rights holders. The addition of Time Warner (which is reportedly investing in the service), would bolster Hulu’s content offering – but the company is also pushing to remove current-season content in order to stem cord cutting. A true bet on digital video would look very different. Traditional media needs to fundamentally reframe its beliefs and strategies. Rather than view the cannibalization of linear revenues and linear consumption as digital growing pains, Hollywood needs to view these losses as an investment in “attention infrastructure”. Giving up cash flow is always tough – let alone in the billions – but considering it an unnecessary loss or the consequence of poor timing is not only incorrect, it’s destructive. 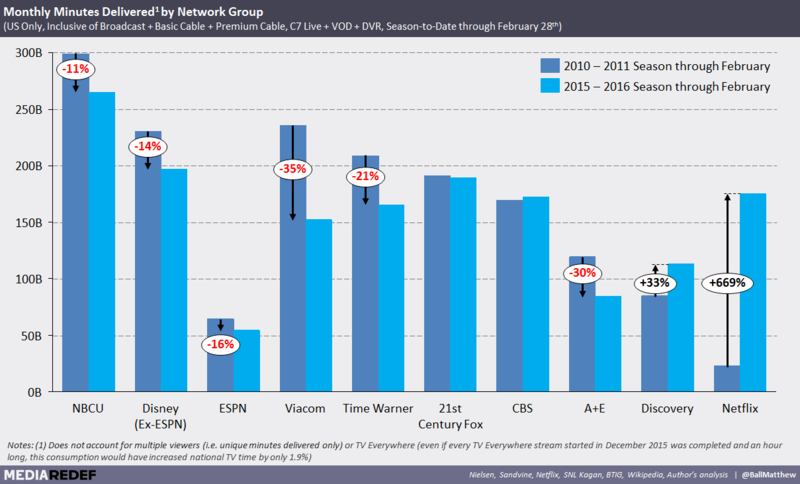 For the past 20 years, television networks have reaped more than $1T inflation adjusted revenues and $300B in net cash flow thanks to what was sown throughout the 1980s and early 1990s (most cable networks took years to hit cumulative net profits, with several market leaders accumulating hundreds of millions in losses doing so). But the harvest is coming to an end. Crop rotation is not a waste; it’s an essential investment in forward productivity. Accordingly, the media incumbents need to actively push audiences away from linear consumption and towards their O&O digital platforms. Not “manage the decline of traditional TV”. Not accommodate “changing audience behaviors” or “build digital revenue streams to offset linear losses”. Actively push audiences online. This will be rough, but it will be much easier than trying to regain these viewers five years down the line. With each passing day, digital leaders such as Netflix, YouTube, Amazon and Hulu become stronger, more independent and more popular. Hollywood needs to strike while its content is most relevant and its audiences still numerous. More tangibly, this means all efforts need to be mobilized behind shifting viewership online. To improve the authentication process, TV Everywhere access should already leverage social network credentials such as Facebook Connect or Twitter’s “Sign In” – given usage rates today, it’s worth cost of sharing user data. To drive online engagement and encourage direct-to-viewer relationships, content should be released early online (with key titles released all at once). Similarly, networks need to accept that digitally-delivered content cannot sustain the same ad loads as the linear distributions they cannibalize. Rather than shore up an entire network portfolio, media companies must also focus their investments and content assets on their most resonant brand. The over-the-top future of television at Time Warner is HBO. Any hit series launched on sister networks like TNT, TBS or Cartoon Network should be made available on HBO Go and HBO Now. Similarly, the vertically integrated media conglomerates would do well to actually vertically integrate their business. Rather than license their top titles to (and through) their competitors, they should be betting on their own content across all release windows. Imagine how an early 2nd window (if not day-and-date) release of Batman v Superman could supercharge HBO Now adoption, or how a consolidated DC Comics SVOD service might fare (today, Warner Brothers has DC series airing on or in development for CBS, Fox, NBC, AMC, Syfy, WGN and CW, which it co-owns with CBS). This would disrupt the traditional entertainment P&L, but vertical integration will be critical as margins compress across individual roles in the value chain (e.g. film financing, production, theatrical distribution etc.). Furthermore, market leaders have already committed to breaking apart the traditional content profit model. Disney’s focus on platform filmmaking left single-window and single-product release strategies behind years ago, while Netflix’s $80-100M blockbuster bet on a David Ayer & Will Smith’s Bright suggests there’s no ceiling to the company’s content ambitions. If Disney, NBCUniversal and 20th Century Fox see Hulu as a pivotal opportunity to create value beyond their own P&Ls (consolidated or not), they need to be more serious about their content commitments and take a long-term (if equity and earnings-based) approach to value realization. No more one-off deals designed to maximize the value of every individual title. Of particular importance is the prioritization of audience scale over price point protection. 200 customers spending $5 a month is more valuable and defensible than 100 paying $10 (or $11 or $12), illustratively speaking. This will be particularly hard for those that own premium cable networks like HBO, Starz and Showtime, but these companies can’t afford to apply linear bundle mindsets to OTT D2C distribution. It will be far harder to build from pricing than it will from penetration and reach – and customers will be owned, not shared across multiple distributors. What’s more, Netflix has firmly set the OTT price-value equation in the minds of consumers. The company launched with over twenty thousand titles and didn’t raise prices from $7.99 to $8.99 until it had amassed 35M subscribers that were watching an average of an hour and forty-five minutes on the service a day. By the time Netflix pushed new user pricing to $9.99, it had nearly 45M accounts spending two and quarter hours each day. Even with a linear head start, no network group should assume their linear pricing will translate. Although none of the above requires putting an end to the traditional Pay TV business model, this transition will still be profoundly expensive – especially for the market leaders. But that’s the nature of infrastructure. Not only is the upfront investment significant, the payback is often long and uncertain. Digital leaders such as Netflix and YouTube certainly benefit from the fact that their strategies face intangible opportunity costs rather than tangible P&L cannibalization, but Hollywood must remember that opportunity costs, too, are a form of investment. And critically, platform shifts represent not just the best time to steal market share, but also the most likely time to lose it. The test of leadership is not strength during times of unprecedented industry growth, but when long-term survival requires substantial short-term costs. Equally important is embracing emerging media opportunities. 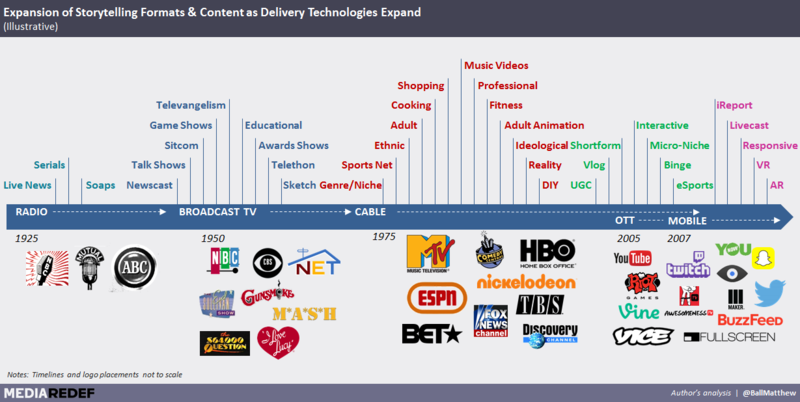 Throughout human history, new distribution technologies have consistently enabled new stories and entertainment formats. The invention of radio brought about live sports coverage, soap operas and the hysteria-inducing reinterpretation of H.G. Wells’ War of the Worlds. Broadcast television, in turn, ushered in weekly video franchises like I Love Lucy, Dragnet and The $64,000 Question, while cable pushed this content into more complex narratives and added all new categories, such as music videos, adult animation and reality TV. And as new categories develop, so too does the opportunity new media companies and market leaders – as the multi-billion dollar empires of MTV, BET, ESPN, HBO and Fox News each proved. As a result, experimentation in new content forms is both a defensive imperative and a key offensive strategy. At no time in media’s history has this evolutionary dynamic been more potent than it is today. Thanks to its open nature and lack of distribution constraints (e.g. finite spectrum or shelf-space), over-the-top delivery has created far more and far more diverse content formats than any medium before it. And crucially, it has also accelerated the ascent of early market leaders. Over the past decade, we’ve experienced the rise of categories such as UGC, short-form video, user broadcast, SVOD and eSports – and welcomed new media giants like Facebook, YouTube, Snapchat, Minecraft, Vine, Twitch and Riot Games. It’s not only telling that Big Media remains mostly hands-off on these categories, but that none of them bought the companies that ushered them in. When it comes to digital-era investments, Disney has certainly been the most active of the major media companies (though IP represents more than 80% of total outlays). Over the past decade, the House of Mouse has bought the largest YouTube Multi-Channel Network (Maker Studios), a mobile gaming company (Playdom), several multi-media storytelling platforms (Marvel, LucasArts, Pixar), become Vice’s largest outside shareholder, doubled down on technology-driven theme park experiences (MagicBand, VR), established an annual fan expo (D23), formed an accelerator program with TechStars (Disney Accelerator) and launched an ever-expanding sandbox video game at the cost of more than $125M (Disney Infinity). Other players have made some interesting investments – such as Time Warner’s eSports league (ELeague), Discovery’s New Form Digital and NBCU’s stakes in BuzzFeed and Vox – but these have predominantly been minority “toeholds”, not control deals. Most of the outright acquisitions have been for ad tech/video delivery capabilities or modest digital video assets like MovieClips. Disney’s estimated $650M Maker acquisition remains the only “big bet” on new content forms or distribution models. Although the acquisition has its skeptics, Disney demonstrated a level of humility that’s rarely seen in Hollywood. [Disclosure] The company knew that it needed to understand youth video culture, influencer-led content creation and social distribution, and recognized that a company 86 years its junior already did. Shockingly, Viacom has been the least active digital media investor – by far. As industry veterans can attest, the company’s empire was built on investments in non-traditional, genre-specific and youth-oriented networks that were at the vanguard of the last “new” delivery model: cable. Though efforts like VH1, CMT and MTV were subject to significant skepticism in their early years, Viacom proved exactly how emerging distribution pathways could better meet audience needs and interests. Still, the industry faces several structural challenges that are hard to overcome – even with aggressive experimentation and perfect execution. For decades, the incumbent media giants benefited from significant barriers to entry, including finite distribution capacity (e.g. broadcast spectrum), high production costs and limited capital availability. Today, however, almost all of these advantages have waned. Competition is now unbound, costs are lower than ever and capital is abundant – a mix that has resulted in unprecedented amounts of video content, attention scarcity and inevitable margin compression. What’s more, services like Twitch, YouTube and Vine have shown that so-called “premium” or “produced” content has no inherent advantage over supposedly simpler forms of video entertainment. Similarly, Hollywood has few available investment opportunities that would meaningfully bolster their attention footprint and deliver meaningful top or bottomline growth, irrespective of their willingness to pay. It’s also worth noting that most of the major attention platform acquisitions came not just from founder-controlled technology companies, but those without a significant media business to cannibalize. In fact, they often made their investment so that they can build a media business of financial scale. I talk about attention above other metrics for a number of different reasons, but chief among them is the belief that the media companies of the future will be defined by what they mean to their customers. Not what they nominally stand for, but how they’re engaged with, how often and why. The best comparative proxy for this engagement is time – especially in content oversupply. And as we at REDEF have argued previously, attention scale will representing the ultimate competitive moat in the digital era. It may not last as long as the infrastructure of the past – and need to be continuously earned, not just bought upfront – but you can tell a lot by how media companies are investing in it. “By Obsessing Over the Present, Big Media has Forgotten its Past and Endangered its Future” is the last of a three-part series on the future of video and Hollywood. Part one,”TV Has a Business Model Problem. And It’s Killing Good TV”, can be found here. Part two, “After TV: Video’s Future will be Bigger, more Diverse & Precarious than its Past” can be found here. This appears to be the consensus effective valuation after earnouts. [Disclosure] Otter Media, which employs the author, is the majority owner of Fullscreen, one of Maker’s primary competitors. The contents of this article do not necessarily reflect the views of Otter Media or its portfolio companies.